It was a beautiful Wednesday morning on June 15, 1904, when mothers and youngsters from Lower Manhattan’s Kleindeutschland (Little Germany) gathered at the pier adjacent to East River Park. They had arranged for a passenger steamer named the General Slocum to transport them to a picnic ground on Long Island’s North Shore. A thousand tickets were collected at the plank—a number that did not include 300 children under the age of ten. Soon after they departed however, as the ship passed 97th Street, the crew saw puffs of smoke rising through the wooden floorboards. When they tried to put out the blaze, the rotten fire hoses burst. 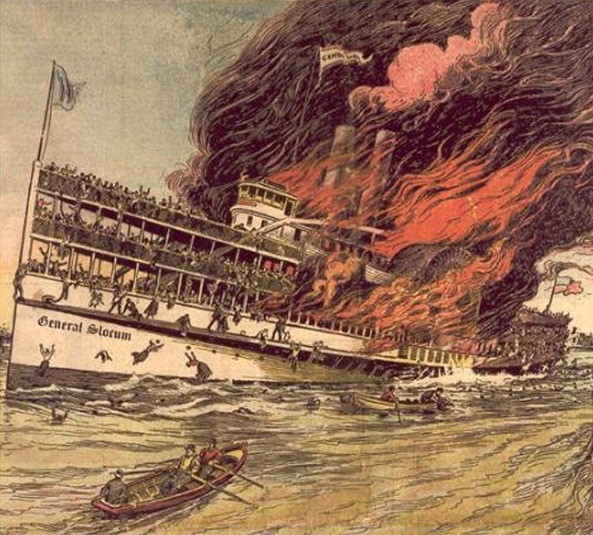 One newspaper described it as “a spectacle of horror beyond words to express—a great vessel all in flames, sweeping forward in the sunlight, within sight of the crowded city, while her helpless, screaming hundreds were roasted alive or swallowed up in waves.” Most of the 1,021 people who died were women and children. A rare menu from the General Slocum, hauntingly dated to the day after the accident, recalls one of the worst disasters in American history. 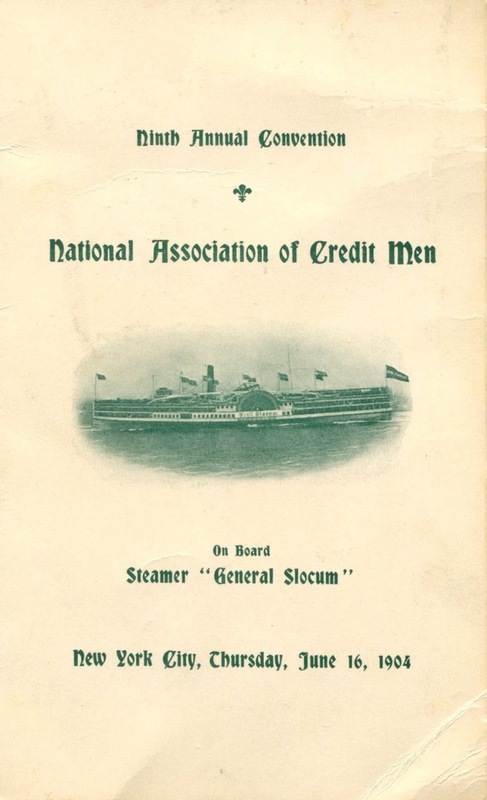 The National Association of Credit Men, then meeting at the tony Savoy Hotel, had planned to take an excursion on the General Slocum the following day. Not missing a beat, the organizers quickly chartered the steamer Rosedale for the scheduled outing to West Point. 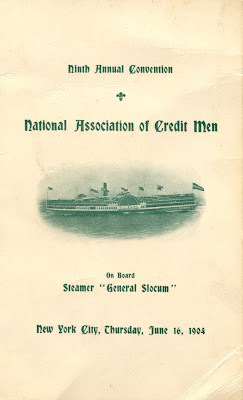 During their cruise up the Hudson, the conventioneers heard speeches about collecting delinquent accounts and discussed ways of punishing fraudulent debtors. 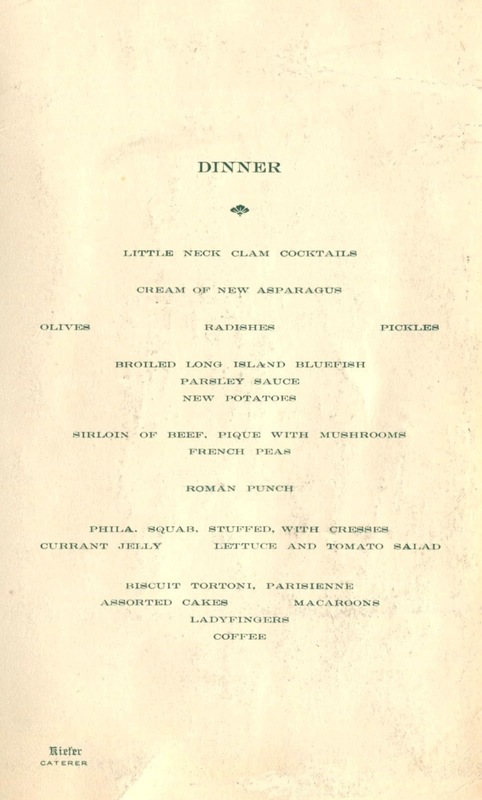 The menu below was printed in advance for the General Slocum. 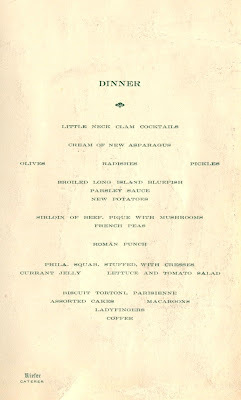 Whether saved as a souvenir from the dinner on the Rosedale or as a token of the disaster, this menu endures as an unwitting memento mori, a poignant reminder of the fragility of life. 2. “Annual Convention of Credit Men at Hotel Savoy,” New York Times, 16 June 1904. 2. This largely forgotten accident has passed from living memory. The last surviving passenger, Adella Wotherspoon (née Liebenow), died in 2004 at the age of 100. At the time, she was a six-month-old infant, the youngest survivor of the disaster that took the lives of her two older sisters.